For the second straight week the top three teams in the VMSL Premier all dropped points this past weekend, allowing the chasing pack to narrow the gap and bunch up below them. Only six points separate the top eight teams as the league reaches the midway mark this weekend, and with a couple of teams having games in hand, including defending champs BCT Rovers Tigers United, there’s a lot of football left to be played before we know where this year’s title is heading. The action got underway at Coquitlam Town Centre on Friday night with Metro-Ford Wolves demolishing Richmond FC Hibernian 7-0. Pretty sure they’ll have been drinking more than 7-Up after that one. Goalscorers aren’t available on the VMSL site at the time of writing. Club Inter EDC Burnaby and Pegasus SFC served up an enjoyable four goal encounter at Burnaby Lake, and it was the proverbial game of two halfs. The Horsemen looked to be in control and on course for the three points after goals from Chetan Jhooty and Javid Kahn in the last two minutes of the first half had them two up at the interval. But Chinter fought back in the second, with Alex Marrello reducing the deficit just three minutes after the restart, and Jordan Michael earning a share of the spoils with a 69th minute equaliser. After such a strong start to the season, Croatia SC now feel like they’re going to be stuck on the 18 points mark forever, after suffering their third straight defeat. CCB LFC United were the ones to put them to the sword this week, with former WFC2 player Victor Blasco grabbing the only goal of the game at Newton in the 56th minute to give the Surrey boys the win. After a tough start following promotion, Guildford FC have really hit their stride these past few weeks and they made it three straights wins with a comfortable 4-1 victory at the still pointless Campo Atletico at Burnaby Lake on Saturday afternoon. Mirsad Kuduzovic got Guildford on their way just six minutes in, with Gurinder Pannu adding a second in the 25th minute. Denis Ananga pulled one back for Campo just past the hour mark, but their fate seemed sealed when Mostafa Jafari was send off for a second yellow card in the 73rd minute. Dipinder Gill and Kuduzovic added a couple of more goals for Guildford for a 4-1 victory, moving them to fourth bottom now in the table. The plight of Campo continues to get worse every week, as they search for their first points of the season. They’re nine points adrift now from moving out of the two relegation places, but as Guildford have shown, hit a vein of form and you can quickly move up the table. To do that though Campo need to find a way to shore up their defence, having now given up 52 goals in their first 10 matches. 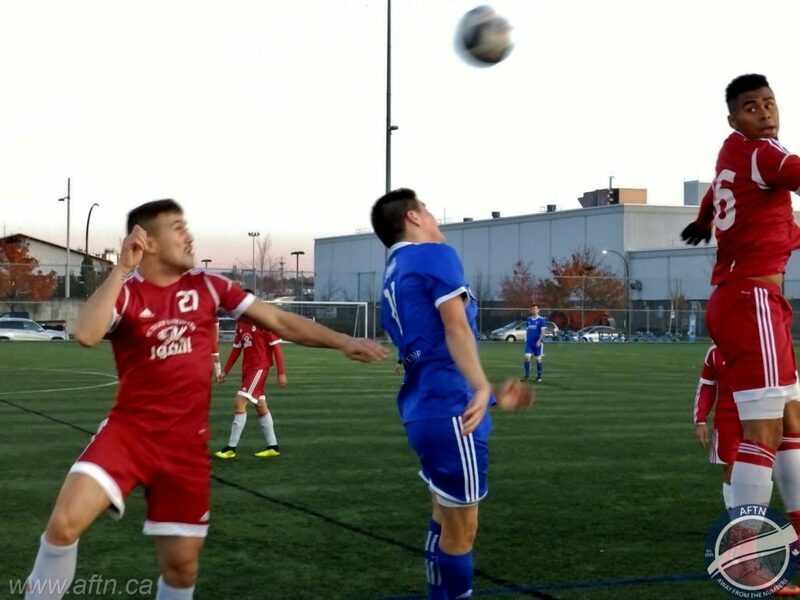 There was no doubt about what was the ‘Game of the Week’ this past weekend, with the top two in the VMSL Premier, Rino’s Tigers and West Van FC, squaring off at Trillium on Saturday afternoon. It was a much anticipated clash, but one that perhaps didn’t fully live up to its billing, as both sides cancelled themselves out for much of the match. Rino’s made most of the running in the first half, with West Van’s impressive defence happy to soak up the pressure and hit on the counter. The Amblesiders were looking very dangerous on every breakaway and they got the opener in the 14th minute when the lively Paul Kelly was played in, ran through on goal, and fired home. The Tigers pressed for the equaliser but their final balls were poor and West Van’s defence looked untroubled, and the visitors could have been out of sight by half time, wasting another couple of great chances from the counter to increase their lead. Rino’s dominated the second half play, but again their final delivery was letting them down and it looked they wouldn’t be able to break down the well organized West Van defence, but then Daniel Johnson tore up the right side with 16 minutes remaining, playing the ball into the middle for Erik Edwardson to fire home his eighth of the season to tie things up. Neither team could find a clear cut chance to break the deadlock in the final few minutes, and a share of the spoils was probably the right result at the end of it all, keeping to the top of the standings tight and with all to play for. 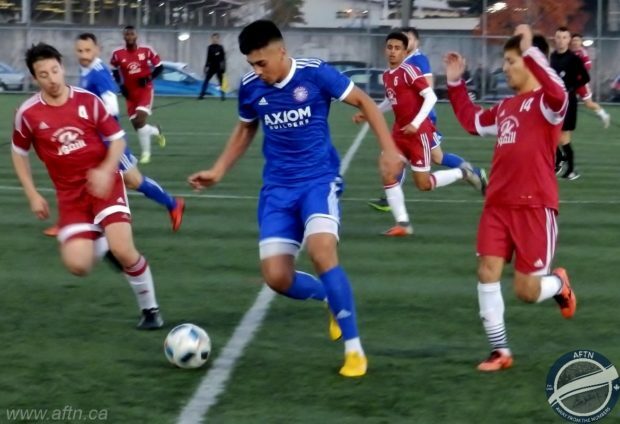 North Van was the setting for the last match of the weekend, with defending champions BCT Rovers Tigers United continuing their resurgence since returning from the nationals, eking out a late 2-1 win over NVFC Norvan at Fen Burdett Mahon. Roderick Watts had the home side up early, opening the scoring five minutes in, before Jeevi Rai tied things up three minutes before the half hour mark. Things looked to be heading for a draw, but up popped Tigers’ talisman Nick Soolsma to secure all three points for the Surrey side with four minutes of the match remaining. That win sees Rovers Tigers sitting in sixth spot in the standing, six points of the top, but with two games in hand, as they look to hold on to their title. Tighter than a gnat’s chuff, and as the schedule hits the halfway point this weekend, and the college players become available to teams, it could be set to get even tighter. 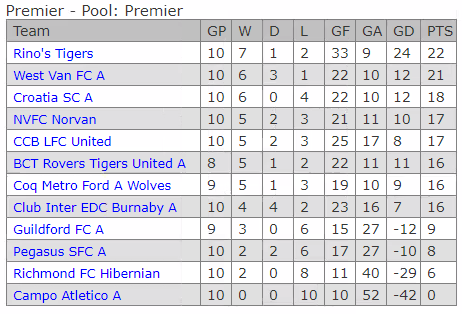 With first placed Rino’s Tigers heading to Burnaby Lake to take on Croatia SC on Friday night in the ‘Game of the Week’ (kick off 8.10pm), and with second placed West Van hosting fourth placed NVFC Norvan, a couple of draws in those and make it a bigger logjam in the standings than it already is. It’s also tight as hell in Division 1, with the top three teams all tied on 21 points. Two of them, ICSF Columbus and Coquitlam Metro Ford Lupi, clash at Burnaby Lake as well on Friday night (lick off 7.25pm), making a trip out the complex an even bigger must! You can get all the results, standings, and fixtures, across all seven VMSL divisions at VMSLsoccer.com and for all your local football banter, head over to the Take The Piss forums.